Since I last wrote about Iluvien back in September (Iluvien Update 8: Alimera Sciences Receives FDA Approval of Iluvien for Treatment of DME), when Alimera Sciences and pSivida announced the FDA approval of Iluvien for treating chronic DME, adding the U.S. to the approvals or pending approvals obtained in seventeen European countries – approved in thirteen and pending approval in an additional four others, the product has become commercially available in the UK and Germany and is scheduled to become available in Portugal shortly. With the FDA approval, Iluvien should also become commercially available in the U.S. in early 2015. In a recent news release, Dr. Paul Ashton, President and CEO of pSivida, said, "We continue to be pleased as Iluvien gains additional marketing approvals in Europe. We believe Iluvien’s efficacy and three-year duration make it an attractive treatment option for many DME patients, particularly in the U.S. where the drug has broader labeling." In addition to the application of Iluvien for the treatment of DME licensed to Alimera, pSivida is independently developing the product for the treatment of posterior uveitis. The FDA recently cleared the company's Investigational New Drug (IND) application to treat posterior uveitis with its injectable, sustained-release micro-insert, permitting pSivida to move directly to two Phase III trials under which it would enroll a total of 300 patients. However, the FDA approval of Iluvien for DME opens up the potential for pSivida to seek FDA approval on Medidur for uveitis with only one Phase III clinical trial, similar to what occurred with Allergan’s Ozurdex and its FDA approvals. The FDA is allowing pSivida to reference much of the data, including the clinical safety data, from the clinical trials of Iluvien for DME previously conducted by Alimera. Under the terms of its collaboration agreement with Alimera, pSivida has joint ownership of, and reference rights to, all clinical data and regulatory filings generated by Alimera, including its New Drug Application (NDA) for DME. pSivida’s injectable micro-insert (Medidur) to treat posterior uveitis is a tiny tube about the size of an eyelash. It releases the off-patent steroid fluocinolone acetonide at a consistent rate over a period of approximately 36 months. The micro-insert is injected into the back of the eye during an office visit through the use of a fine gauge needle. Tiny device and lots of teamwork save Olathe leukemia patient's sight. This is a story about a software engineer from Olathe, Kansas. David Jiang was in danger of losing vision in his left eye when his eye specialist tracked down the inventor of a tiny eye implant that releases an anti-viral drug. Jiang was examined recently by Siddhartha Ganguly (left) at the University of Kansas Cancer Center. David Jiang (left) says his vision remains slightly blurry but his retina is recovering after receiving the implant. 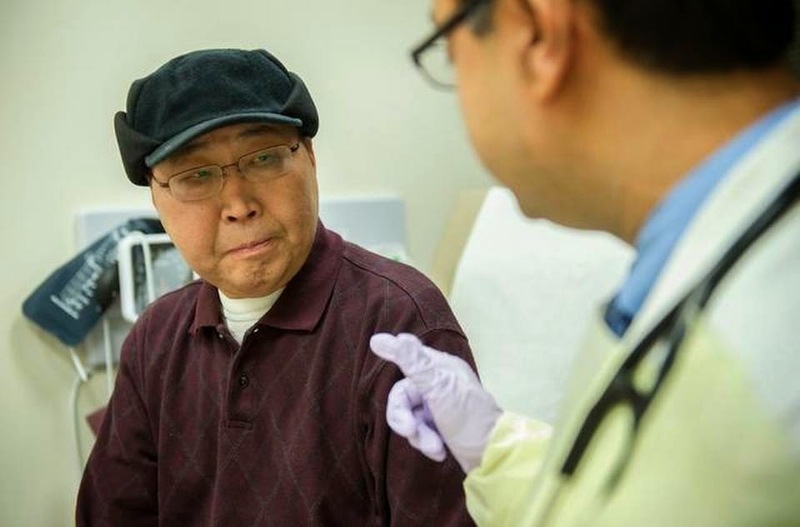 A year ago, after a routine physical, Jiang got the disturbing news that he had leukemia. "I was shocked," he said, when his doctor called him with the diagnosis. His life was in danger, the doctor warned him. Jiang had been heading out the door to lunch. He changed his destination to the University of Kansas Cancer Center. The next morning, he started chemotherapy. But the chemo wasn't doing the job of ridding Jiang's body of his cancerous bone marrow and the abnormal white blood cells they were producing. Doctors decided he needed a bone marrow transplant, a tough and sometimes risky course of treatment. 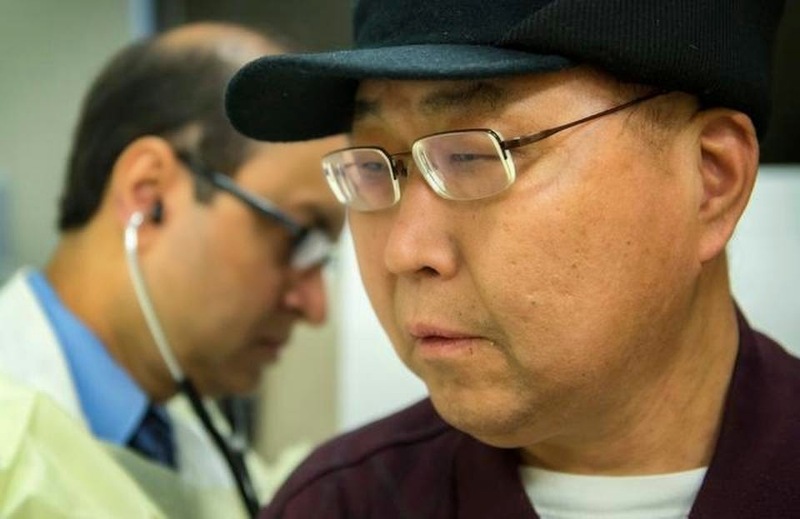 A bone marrow donor was found, and Jiang received the transplant in April. So, what does this have to do with Jiang's eyesight? Before cancer patients undergo a bone marrow transplant, they must go through a rigorous course of chemotherapy or radiation to eliminate their own diseased marrow from their bones. The donated marrow is infused into their bloodstream and migrates to their bones, where it grows and begins producing healthy blood cells. But bone marrow cells are also the source of the body's immune system. Until new marrow can renew patients' immune systems, they're exceedingly vulnerable to all kinds of infections. And as with other kinds of transplants, there's the potential for rejection, which can slow recovery. When kidneys, livers and other organs are transplanted, the immune system of their new owner may sense them as foreign objects and launch a search and destroy mission. But with bone marrow transplants, rejection comes with a twist. It's the bone marrow itself, the person's new immune system, that sees its new home as the alien and attacks the patient. It's called graft versus host disease. That's what happened to Jiang. "After the transplant, I was exhausted," he said. "I had one complication after another." There were headaches and stomach pain. To keep his graft versus host reaction in check, Jiang had to take drugs to suppress his immune system. And that is how his eyesight was put in jeopardy. Like most adults, Jiang is a carrier of cytomegalovirus, also called CMV. It's scary-sounding, and the virus can be life-threatening. But people with healthy immune systems generally keep it in check and never know they carry it. But in people with compromised immune systems, such as those with AIDS or bone marrow transplants, cytomegalovirus can cause big trouble. Depending on which organs CMV attacks, it can cause inflammation of the brain, seizures, coma, ulcers in the digestive tract, pneumonia or inflammation of the liver. The virus also can attack the eyes. For Jiang, it began a painful attack on the retina of his left eye, blurring his vision. "We needed to stop this virus where it was or it was going to eat away the center of his vision," said Ajay Singh, Jiang's eye specialist at the University of Kansas Hospital. Singh started twice weekly injections of an anti-viral drug (ganciclovir) directly into Jiang's eyeball. The injections were painful and risked causing an infection. Singh couldn't give Jiang an oral version of the drug because it could damage his new bone marrow. But Singh knew that during the AIDS epidemic, CMV eye infections were so common that a tiny device was created that could be loaded with medication and implanted directly into a patient's eye where it would slowly release the drug. Singh wanted one of these implants for Jiang - his patient was an ideal candidate - but they were nowhere to be found. It turned out that AIDS treatment had advanced so far that people with AIDS no longer were developing CMV eye infections. The implant manufacturer had pulled it off the market about a year or two ago, he found. Singh was worried: The infection was a millimeter from the center of vision of Jiang's retina. If he didn't get an implant within a month, his vision could be lost. "The odds were stacked against him." Early in October, Singh started making calls to Singapore, India and Mexico City, searching for an implant. He emailed the CEO of the company that discontinued the device but never received an answer. Eventually, the people Singh was contacting told him of an eye doctor in Kentucky who knew the original inventor of the implant. The Kentucky doctor put the two in touch. And it is here that the inventor-entrepreneur enters the picture. "Dr. Singh somehow rooted me out," said Paul Ashton, CEO of Massachusetts-based pSivida. While pSivida had licensed its CMV implants to another company, it was still making other drug-dispensing eye implants. Its newest is the size of an eyelash and can hold enough medication to treat diabetic eye disease for three years. Ashton offered Singh a slightly larger implant, about the size of a grain of rice, that would hold enough of the ganciclovir anti-viral drug. "It was simply a matter of putting in a different drug," Ashton said. "We were changing the ammunition but keeping the same gun." Singh recalled Ashton saying: "If you can send me the drug and get approval from the Food and Drug Administration, I will make you the implant." So Ashton went to his laboratory, testing the permeable ends of the tiny tube to be sure they would allow the drug to ooze out at the right speed. "It was a month of many sleepless nights. It was a race against time," Ashton said. "You can't keep injecting someone in the eye. Something bad is going to happen." Singh marveled at the speed with which Ashton's laboratory worked. "It's not like a car engine part" off the shelf, Singh said. "They have to test it. To do it in four weeks is a big deal." In early November, the implant was ready. Singh called the FDA for emergency approval for the implant. "The FDA responded at lightning speed," he said. "I got an answer in four hours." On Nov. 5, Singh implanted the device in Jiang's eye at KU Hospital. "Now his cancer doctors can keep working on getting his bone marrow up and running," Singh said. The implant will continue delivering the drug to Jiang's eye for nine months to a year. "By that time, his immune system can recover and get the virus under control again." Jiang said his vision is still a bit blurry, but his retina is recovering. Singh has assured him that in a few months, with new prescription glasses, he will be seeing well again. So far, his cancer hasn't returned and his graft versus host disease is well-controlled. Jiang is grateful to the far-flung team that saved the vision in his left eye. "They all worked together. They worked so well together. I'm so fortunate." To read more about how the pSivida drug delivery system works, please take a look at my initial writeup of Iluvien: Iluvien and the Future of Ophthalmic Drug Delivery Systems. Tiny device and lots of teamwork save Olathe leukemia patient's sight, Alan Bailey, The Kansas City Star, January 2, 2015.